One year ago Russian then-President Dmitry Medvedev took office as the Prime Minister. Pundits sum up the first year of his government. Experts are divided on the first year of Prime Minister Dmitry Medvedev’s Cabinet, but they all agree that the government has turned “technical” – the way it used to be during Vladimir Putin’s second term as president. They believe Medvedev’s government is the only one possible under President Vladimir Putin, as there can be no independent political players on Putin’s team. Thus, no one expects him to dismiss the government any time soon. “It is as hard to be the head of the government as it is to be the president,” Dmitry Medvedev said, describing his “first emotional observation” of his work in Russia’s White House. “The situation is nothing extraordinary: There is nothing overdramatic, but nothing good is happening, either. 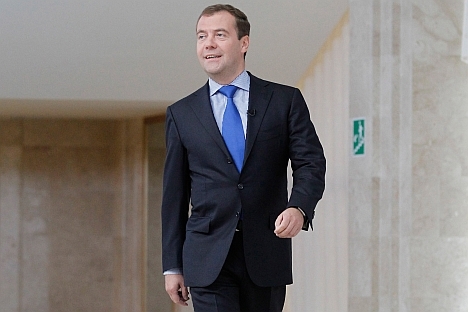 That’s what irritates everyone most,” said Medvedev. Some former ministers were appointed aides and advisors to Putin, and former Economic Development Minister Elvira Nabiullina will soon head the Central Bank, having worked as a presidential aide for one year. “From its very first day, Medvedev’s government has worked in a much tighter economic environment than Putin’s government did back in 2008,” says Minchenko. Putin led the government following elections that favored the party in power. Dmitry Medvedev, on the other hand, became prime minister after less successful elections for the ruling party, even though Medvedev himself topped the election list. Moreover, mass protests began in the wake of the elections. The president ordered the new government to execute his decrees of May 6 even before it had been formed. Experts still doubt that all of those decrees can, indeed, be implemented. Former Finance Minister Alexei Kudrin told an Open Tribune meeting of the ruling United Russia party that, in order to execute the presidential decree that involves raising the wages of public sector employees, the government would have to give up on the investment climate, which must be improved in line with another decree adopted in May 2012. The head of the Russian Audit Chamber said that the decrees would require up to 700 billion rubles (more than $23 billion) if they were to be implemented. These “difficulties” were among the reasons for the drop in the Cabinet’s approval rating, as reported by leading Russian sociological research organizations. Back in May 2012, a Levada Center report said that 53 percent of the population approved of the government’s activities; yet the figure had fallen to 44 percent one year later. The number of those who disapprove of the government’s policies increased to 55 percent from 46 percent. VTsIOM, another major research organization, also reports a decline in the government’s approval rating. The change in the attitude toward Dmitry Medvedev indicates that “he is no longer perceived as an independent political figure” since he lost his status as head of state, says Igor Yurgens, head of the Institute of Contemporary Development. Medvedev earned a reputation for being a liberal when he was president, so the “liberal wing of the ruling elite” hoped he would seek a second term. However, Medvedev went on to become head of the United Russia party, thus declaring his conservative stance. “And he remained on Vladimir Putin’s team, which cannot have any independent political figures,” Yurgens says. Experts agree, therefore, that the government will not be dismissed any time soon. “Some ministers may be replaced,” says Alexei Mukhin, president of the Center for Political Information. Minchenko argues that personnel decisions will depend entirely on the economic situation.